Oh dear! The date for the Birdie Sling Bag in the last newsletter was incorrect. The actual date is AUGUST 29th, not Septemberf 29th. Please let me know if the confusion has knocked you off your rocker and you need to adjust your plans for the class. Welcome to new subscribers to the Quilt with Mo Newsletter. This newsletter is designed to announce special offers and unique class opportunities to you first, before being announced to the Constant Contact email list. Birdie Sling Bag on September 29th, with only one seat left. If you want to bring a friend, I may be convinced to add room for her. Just let me know. I've also heard from several of you that you would love to attend, but the date is not good for you. Please email me if you would be interested in a class on another date, and whether you would like week-day, evening or week-end. Jelly Roll Braid on September 12th, again with only one seat left. We are going to make a braid quilt using a jelly roll, and I'm going to give you three different techniques. Let me know if you would be interested in this class, so I can reserve your seat. As always, let me know if you would be interested in a Braid class offered again this Fall. I've been busy with my web master building a "new look" for the website, and a more thorough Online Shopping experience. Hopefully that will be coming up soon. I want to be able to provide you with first opportunity to reserve pre-cuts (jelly rolls, layer cakes, etc.) and kits, block of the month clubs, and buck-a-blocks even before they are out in the stores. The Marketing Director from Moda was visiting the Studio recently, and she told me it's perfectly legal to give you a "Sneak Peek" of upcoming lines, and allow you to pre-order. I'm excited! So be sure to check out the Online Shopping page and see if there's anything there that catches your eye. And if not? Then you are welcome to visit www.unitednotions.com and view all the current and upcoming fabric lines. If you see something that I do not have in the store, then let me know and I'll be happy to order it for you. I'm in a learning curve of what types of fabric designs you like. By the way, shipping is free with your orders! But ...if you live close enough to drop into the Studio and pick it up you'll receive a 10% discount on the ordered item. (This current website is not very friendly for me in moving pictures around and putting them exactly where I want them, so please be patient with the formating of my newsletter pages until I can get this figured out. That's why the kit pictured here is scrunched closely to the written copy). 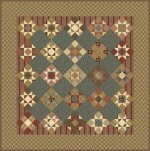 What you see here is "Civil War Homefront", a Moda kit coming to us in the Fall. I love it! If you like it too, then email me at quiltwithmo@aol.com to reserve a kit for you! Another first for the Studio is carrying two quarterly magazines: "Quilts And More" and "Quilt Sampler". I just received the Fall issue of "Quilts and More" with 29 creative projects. The magazine's editor told me that the Eastside doesn't have easy access to these magazines, so you are welcome to pick them up here at regular newstand prices. I have quite a bit to share with you, but I don't want to give you too much at once. So look for updated newsletters more frequently, followed up by a mass email from the Quilt with Mo Studio. Thank you for taking the time to read this newsletter, and call or email me if you have any questions.